Graduate studies in the Department of Mechanical and Aerospace Engineering (MAE) lead to the M.S. and Ph.D. degrees in engineering sciences, with a specialization in one of the following areas: aerospace engineering, applied mechanics, applied ocean sciences, computational science, engineering physics and mechanical engineering. Beginning Fall 2011, we are pleased to offer a professional Masters of Advanced Studies (MAS) degree in Medical Device Engineering. We are also co-collaborators on two other MAS degrees in Simulation-Based Engineering with the Structural Engineering Department and Architecture-Based Enterprise Systems Engineering with the Computer Science and Engineering Department. 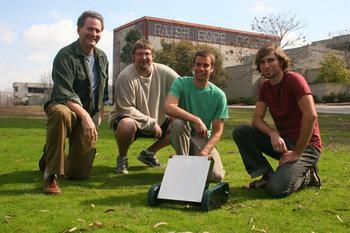 The instructional and research programs in MAE are characterized by interdisciplinary relations with the Departments of Bioengineering, Electrical and Computer Engineering, Computer Science and Engineering, Mathematics, Physics, and Chemistry and with associated campus institutes such as the California Space Institute, Center for Magnetic Recording Research, Center of Excellence for Advanced Materials, Center for Molecular Genetics, Institute for Pure and Applied Physical Sciences, Institute of Geophysics and Planetary Physics, Scripps Institution of Oceanography, UCSD Center for Energy and Combustion Research, Fusion Energy Research Program, Institute for Nonlinear Science. Incoming students can turn in an ID card photo using the Photo Tool App online at https://students.ucsd.edu/finances/campus-cards/photo-tool.html. This will avoid waiting in a long line at the beginning of the quarter. The Graduate Affairs Committee oversees that MAE department's admissions, degree requirements, and course planning. At the end of each academic year, MAE gives awards to the Outstanding Graduate Student, Distinguished Fellow, and the Outstanding Teaching Assistant. Previous year's recipients are listed below. Other awards are listed under the Awards tab.